FFWPU Japan: The “Exciting Global Village” held on a beautiful autumn day family”, which was the concept of this global village project. The profit obtained from this event will be donated to international support activities. The square was packed with young people who gathered from all over the nation to attend the event, making it hard to move from one place to another. It was enveloped with the mood of festivity, even before the actual rally began. At the stalls, they shared information such as the annual local activities of youth volunteers to foreign countries, and the various international contributions made by supporting organizations. They also displayed their countries’ cultures and sold folk handicrafts and rare foods. The visitors could have a taste of these exotic dishes on the spot, and experience “a bite into the whole world” and the “global family”, which was the concept of this global village project. The profit obtained from this event will be donated to international support activities. At the Philippines’ booth encamped near the entrance of the square, they took pictures of visitors with an instant camera and asked them to write a message to the children in the Philippines, beside their photo. They will send these photos to the Philippines. In the Philippines, organizations such as the Youth Federation for World Peace have been continuing support for “school lunch” and education for the children. They visited the Leyte Island this March, where a huge hurricane hit last November leaving them in complete disaster. They helped repair an elementary school building and pictures of these activities were displayed within the booth. At Nepal’s booth, a staff wearing its native costume welcomed the visitors with a “Namaste” greeting. They sold casual jewelry and small gadgets inside a pleasantly aromatic booth. Body painting with “henna”, the sap of a tree that grows in the tropics, of leaves and vine designs was popular among women. 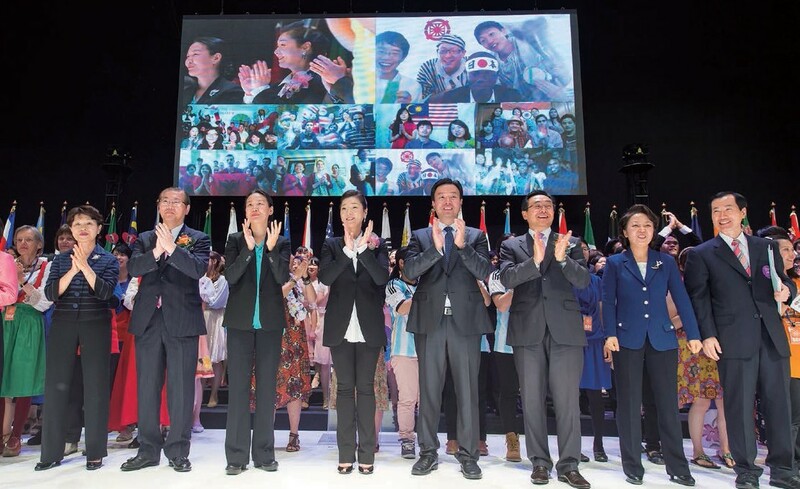 As a prelude to the “Global Youth Festival (GYF) 2014” convention, the “Exciting Global Village” event was held from 10 am on the 23rd, at an open square in front of the Makuhari Event Hall. There were stalls from around 40 different nations featuring each country’s unique characteristics, and a variety of performances entertained the guests. There was a long line in front of the Taiwan booth, waiting to get a cup of “tapioca milk tea”. At the American Las Vegas booth, they prepared a “one hundred yen casino”, where the visitors could win snacks and other prizes playing the roulette. Each booth was extremely lively with their own display of “things” and events unique to their country or area. At stage center, visitors could enjoy a variety of performances from different countries, adding color to the event. Just a stroll through the square, and the visitors could literally experience “a bite into the whole world”! Next story The National Memorial Service Calls for Action!